Things are really starting to pick-up here in Tamale as my roommates and I settle into routines, make new friends, and become more involved in our work. We have been exploring Tamale and discovering all it has to offer including lots of good restaurants and bars, swimming pools, and the Culture Centre. 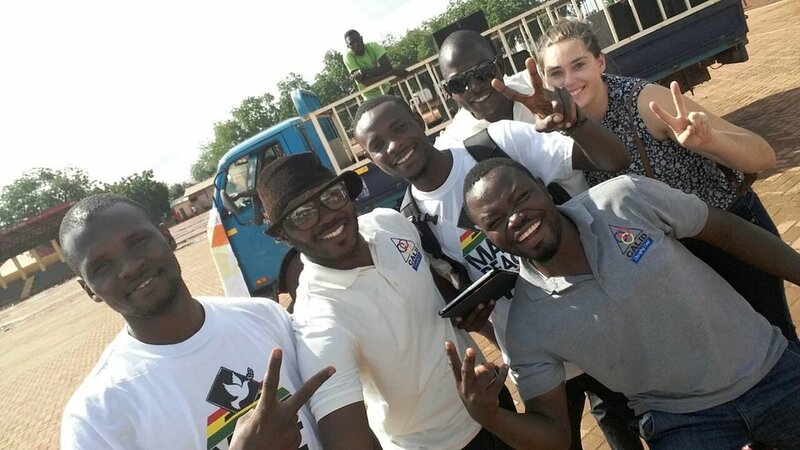 We have even been lucky enough to attend events like a Ghana Black Stars football game and go on a weekend trip to Bolga and Paga! I have learned so much about Tamale, about life in Ghana, and especially about CALID and the work that they do. I have been working hard to find my place within the organization and to be as useful as possible. My co-workers have been exceptionally warm and welcoming, taking the time to teach me and include me in their work. They are even trying to teach me some Dagbani (the local language), although I am afraid I am a rather hopeless student. Thus far it has been humbling to learn about all the ways CALID works to empower communities and improve the wellbeing of individuals. CALID’s three main areas of focus are education, governance and health. Some of their current project include work with youth groups to promote peaceful elections as the Ghana General Election approaches in December, as well as projects monitoring the quality of education in various districts, improving school governance, and improving female school enrollment. As a resource mobilization specialist I spend most of my days at the office, but I have also had a few opportunities to go into the field to see some of these projects! In September I attended a Peace March organized by a group of youth campaigning for peace in the upcoming election. 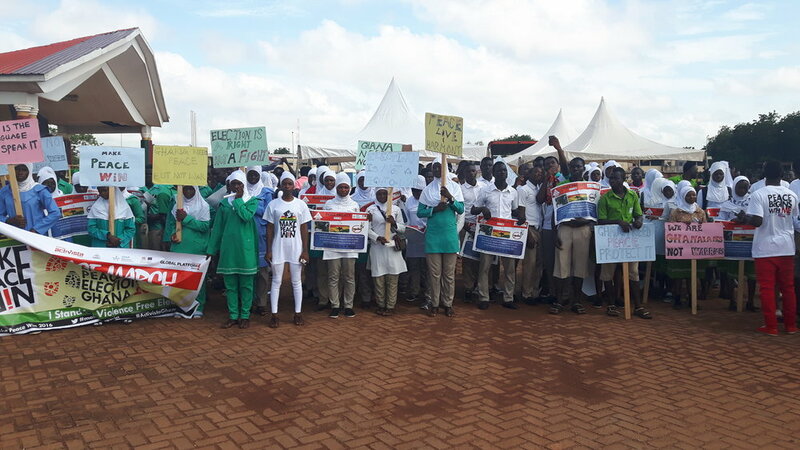 About 250 people from around the Tamale metropolitan area participated including youth group members and traditional and religious leaders. Energies remained high as we walked through the streets with banners and megaphones, and drew lots of attention from the general public. Hopefully through their work promoting peace and educating voters there will be fewer instances of conflict at polling stations this December. It was exciting to meet such a dedicated and passionate group of young people. On another occasion we drove to some schools in peri-urban communities around Tamale to see their water and sanitation infrastructure. One of the schools we visited had a rainwater harvesting system that served as the main source of water for the community. The other school had no reliable water supply except for a well located a short distance from the school near where the children defecate in the woods, and which is often empty in the dry season. It is still common for schools to lack these basic necessities even though there are many organization working to improve WASH (Water, Sanitation, and Hygiene) infrastructure here in Ghana. Most recently, I was able to go to a meeting with parents at some local primary schools, where my co-workers were executing a dissemination activity about literacy and numeracy assessments. The test results of children in the community were presented, creating an opportunity for parents and teachers to discuss possible ways of improving their children’s academic performance. Adjusting to life in Tamale has definitely been challenging at times, but after two months I am really starting to feel at home. I am learning lots and working on some interesting projects. I hope that over the remaining four months of my internship I will continue to grow into my role and be able to contribute to the organization. I am excited to continue working with CALID and see what the next 4 months will bring! 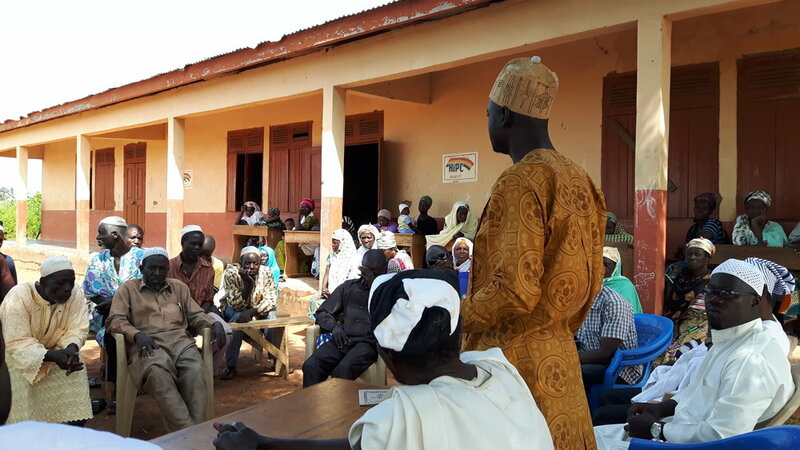 Travis Jacox is working as a Resource Mobilization and Management Specialist with Centre for Active Learning and Integrated Development (CALID) in Tamale, Ghana.